Does Monkey need to stay open? Do beacons allow others to access the data on my phone? How do I add a beacon? How do I disconnect a beacon? Can more than one parent pair with a beacon? How do I change my beacon's name and picture? How do I configure a Radius Networks RadBeacon Dot? Why can't I activate my beacon? Why is my beacon's signal weak? Still need help? Click here to shoot us a message! Beacons are easy to carry devices that periodically emit a bluetooth signal. The Monkey app listens for these signals in order to gauge the distance between you and your child. Monkey uses the signal strength of a beacon carried by your child to determine your distance from your child. When that signal drops beyond a certain level, Monkey will alert you that your child has wandered off. Nope. As long as the application remains active in the background and bluetooth is on, it will continue to monitor your monkeys and alert you if they go too far. Feel free to continue using other apps on your phone. Never. 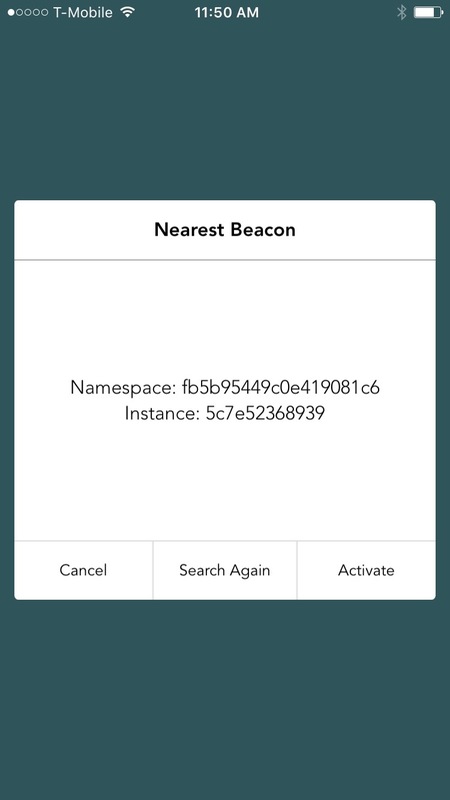 Beacons do not have access to your phone’s data and only pulse a bluetooth signal monitored by your phone. Put simply, your phone accesses data from beacons, but not the other way around. Press + in the top-right of the Home Screen. Monkey will search for and pair with your beacon. You will be prompted when Monkey finds a beacon, select "Activate". 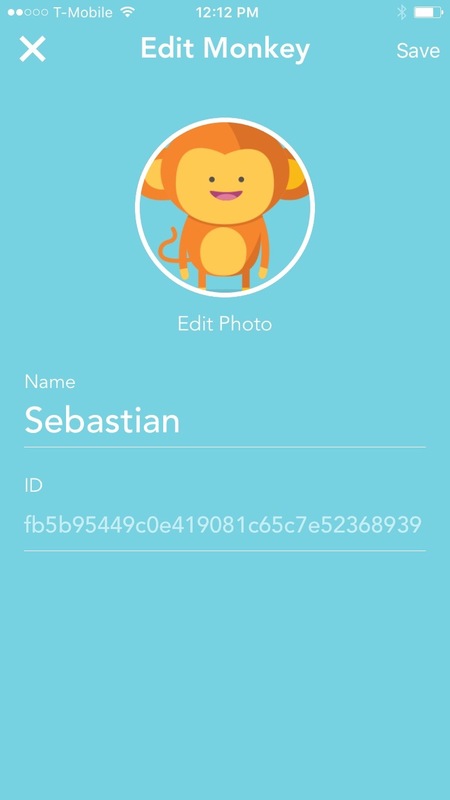 On the Edit Monkey Screen, label the beacon with something like your child's name and add a picture. You can always come back and change these later. Keep only a single beacon nearby while pairing. Multiple beacons make it ambiguous for Monkey to know which beacon to pair with. From the Home Screen, open the Menu in the top-left and tap on “Manage Monkeys”. Then, tap on the beacon you wish to disconnect. Once on the beacon Edit Screen, tap on “Remove Beacon”. Bluetooth technology pairs with a single device at a time. However, a device can be paired with multiple beacons, allowing a parent to monitor all of their kids from one device. Select the beacon you wish to edit. 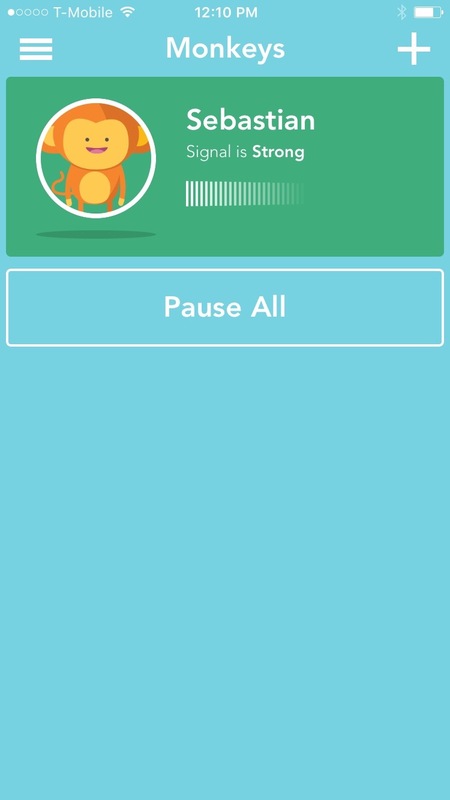 Once on the beacon Edit Screen, you can change the profile picture by tapping on it or the "Edit" button below. To change the beacon's name, tap on the "Name" field. To confirm your changes, press "Save". Why don't we use GPS? We kept Monkey simple. We believe an early warning will help keep your children from wandering too far. Monkey is meant to measure your child's movement away from you (proximity). We used 3 different settings to program just how far away they can wander before you are alerted. In the "tight" setting git is approximately 15 feet, in the "loose" it is approximately 150 feet. In the "manual" setting you can decided anywhere in between. Make sure your device has Bluetooth enabled. This setting can be accessed from your phone's bottom tray by swiping up from the bottom edge of your screen. You are too close to other beacons. Other beacons in proximity may interfere with the pairing process. Try again after moving them away. Your beacon is too far from your phone. Make sure your beacon is within a 1 ft vicinity. Bluetooth enabled in phone's bottom tray. A weak signal indicates that your beacon is approaching the maximum range set in Monkey. To allow your child to travel further without triggering an alarm from Monkey, navigate to "Settings" and drag the "Strength Limit" slider to a more relaxed setting.